Powerful bomb, apparently intended for Independence Day attack, found hidden on PA truck delivering goods to Jewish communities in Samaria. Security inspectors on Wednesday located an explosive device in a PA Arab truck at the Reihan crossing, west of Jenin. The powerful explosive device was hidden in the roof of the truck. The truck had merchandise intended for Jewish communities in the seam zone. Police sappers are now working to neutralize the threat near ​​the crossing. The Arab driver was arrested. The head of the crossings authority at the Defense Ministry, Erez Sidon, praised security forces' activities at the crossing in cooperation with police sappers. 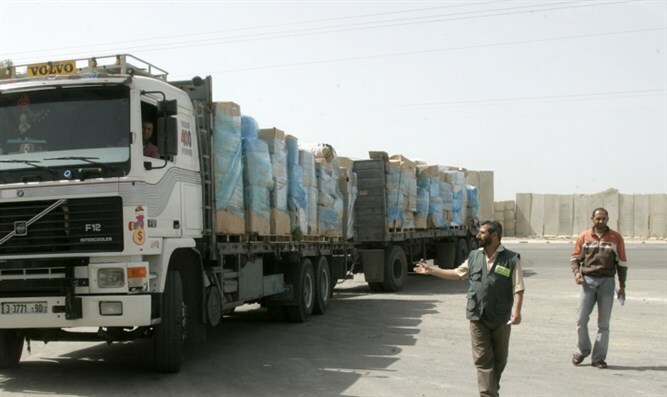 "I am proud of the security inspectors who acted exactly as we expect them to, from the identification of the suspicious truck to the identification of the attempted smuggling that turned out to be an explosive, apparently intended for an attack during Independence Day," Sidon said. Defense Minister Avigdor Liberman also commended forces for apprehending the terror vehicle. "The vigilance and professionalism of the crossing authorities at the Defense Ministry led to the uncovering of a bomb and the thwarting of a major attack on the 70th Independence Day, and we will pursue those who planned to attack our holiday," he said.